Oh how I wish it would warm up for so many reasons! Flowers, warmth, bright colors and so much more! Today on my walk through the greenhouses I saw a wonderful reminder of warm places. 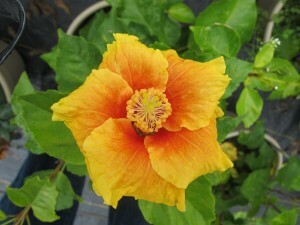 Childhood memories of going to Florida and seeing all the Tropical Hibiscus were revisited when I saw the Tropical’s blooming. Oh how I love warmth and how I wish I were in Florida right now!